Photo courtesty of Oliver Walter Solmitz, MFA. 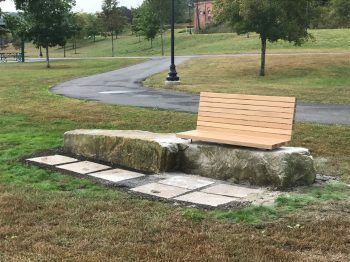 In weather threatening to rain, two new benches were installed in Augusta’s Mill Park on September 26, the culmination of a full year of design and building by three students from the Bachelor of Architecture program at the University of Maine at Augusta. The project began in early fall 2017 when the Augusta Age Friendly Committee, in cooperation with the Augusta Downtown Alliance and a significant financial contribution from Augusta resident Melda Page, approached the City of Augusta for additional benches that senior citizens might utilize while out and about in the Capital City. 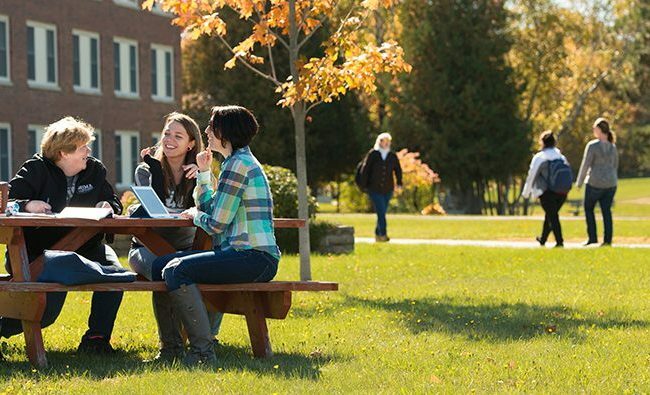 This resulted in Sherry Belka, a member of Augusta Age Friendly Committee, approaching the Bachelor of Architecture program at UMA to design and build two benches. Participating in this project were Andrew Treworgy, a fourth year student from Gardiner, Shauna Riordan, a third year student from Lisbon, and Sam Gerken, a fourth year student from Yarmouth, all part of the UMA Bachelor of Architecture program. Oliver Solmitz of Waterville, UMA’s Architecture Lab Supervisor, provided leadership, bringing his many years of design and construction experience to the project. In undertaking this project, the students were inspired by the history of Mill Park and its views of the river, as well as the prevalent granite on the site. Leif Dahlin, Director of Community Services with the City of Augusta and Duane Scott of the Augusta Age Friendly Committee worked with the students to fine tune the concept. One of the key design criteria was taking into account the seasonal flooding of the Kennebec River. Students went through countless design iterations followed by working drawings and prototypes. This resulted in a brilliant design detail that allows the removal of the wooden bench seats from the underlying granite supports in the event of flooding or during the winter snowfall. Final fabrication involved the Architecture Department’s new woodshop facility. 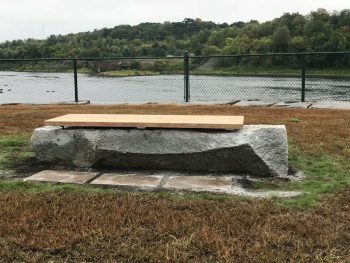 A true community endeavor, Elwell’s Masonry drilled the needed holes in the granite; stainless steel fabrication was provided by Dufour’s Welding; and the Augusta Public Works Department employees, led by Foreman Chris Blodgett, provided heavy equipment, manual labor, and years of experience with the Mill Park site during the installation. While winter is not far away, the new benches promise a place to rest while enjoying Mill Park and the many events happening there through the nice weather now, and for years to come.